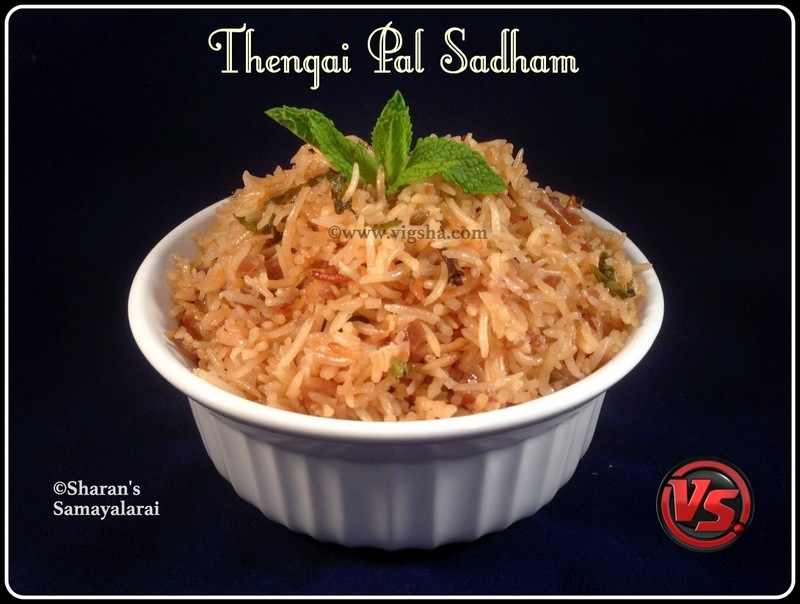 Thengai Pal Sadham is rich and delicious recipe that is flavored with the Indian whole spices and butter. The lovely aroma of mint leaves and basmati rice will fill the kitchen. Try this simple and exotic recipe & flare up your taste buds. I have tried this recipe several times and it works like a charm. I prepared this recipe when my cousin's family visited us and they loved it. Check other flavored rice recipes which I have already posted :- Jeera Rice, Chicken Fried Rice, Egg Fried Rice, Peas Pulao. 1). Rinse the basmati rice & soak in water for 10-15 minutes. Heat a tbsp of ghee/butter in a pan, add the soaked rice (without water) & Saute gently for about 2-3 minutes. Sauteing the rice in ghee or oil, prevents it from becoming soggy and separates each grain. 2). Heat butter in a pan/pressure cooker, add cloves, cinnamon and bay leaf. Saute till the aroma arises and add the chopped onions, ginger garlic paste, salt and green chillies. Saute till they turn golden brown. 3). Then add the roughly chopped mint leaves and saute. Switch off and transfer the sauteed items to rice cooker along with rice. If using pressure cooker, add the rice to the sauteed items and mix. 4). Add a cup of coconut milk and 1/2 cup of water and combine everything together. 5). Close the lid of the cooker and let it cook. Once done, remove from the cooker and fluff it fork . Done ! Exotic Thengai Paal Rice is ready ! Serve it with any spicy gravy. I served it with Chicken Varuval. # I have used ready-made coconut milk. You can also use thick coconut milk directly squeezing the grated coconut. # Adjust the water/coconut milk level according to the rice you use 1:2 or 1:1. I have used 1 : 1.5 for this recipe. # Make sure not break the rice while sauteing. # You can use any rice variety for this recipe, long-grain rice suits best.